Let's talk cookbooks today, shall we? I'll admit upfront that cooking for me is a hobby, and not as much a daily obligation. I know I'm something of an anomaly in that way, because if I don't feel like cooking one night, there isn't going to be a mutiny of unfed children. And I live in a city large enough that take-out is always an option when I'm feeling lazy. But cooking every single day is it's own challenge, and one that I've been trying to work up to. So when I was offered a review copy of The Woman's Day Everyday Cookbook, I agreed to give it a try. The premise of the book is 365 recipes, organized by month, and then again by week. Each recipe includes schedule-saving information like number of serving, active time and total time. And each month begins with shopping lists broken down by week and listed according to the section of the grocery store where each ingredient should be found (produce, bakery, meat, deli etc). In theory, the book takes all of the planning out of menu planning, and even out of grocery-list making. The fact that such a practical book would be organized seasonally speaks to how mainstream seasonal cooking has become, and with good reason. We all know seasonal produce tastes better, but it's also less expensive and I think encourages eating and cooking with a variety of foods rather than getting stuck in the same old rut of chicken breasts and mashed potatoes. I'm going to be honest and tell you that at first glance, I thought these recipes were way too simple to be interesting. Wrong. Seriously, I was completely wrong. I LOVED both of the recipes I chose to profile out of this book, but especially this one. I mean, six ingredients (not counting salt and pepper) and it was one of the best vegetarian dishes I've made. I wish it didn't sound like I was being all hyperbolic right now, but I've made spaghetti squash recipes that required much more work than this one, and they weren't any better. This is the kind of dish you can have memorized after one go, and then pull out of your sleeve at a moment's notice. 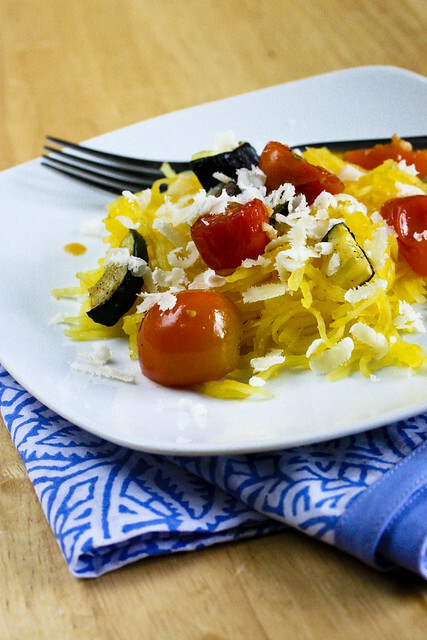 If you've never made spaghetti squash, don't expect spaghetti, because the resemblance ends at the shape of the strands you scrape out of the shell. This recipe is slated for May 10th in the book, so I'm pretty much right on time with it. Yes, it uses tomatoes which are completely not in season right now, but roasting them makes up for any taste deficiency out of season tomatoes might have, and anyway, this isn't the first time I've recommended roasted cherry tomatoes before their season. Position the oven racks to divide oven into thirds. Heat oven to 425F. Line two 15 x 10x 1/2" baking pans with nonstick foil. Halve tomatoes; place tomatoes, 3 Tbsp oil and the garlic in a 13x9-in baking dish. Halve spaghetti squash lengthwise and scoop out seeds. Brush cut surface of squash with a little of the remaining 1 Tbsp oil; place flash-side down on a foil-lined pan. Quarter zucchini lengthwise and cut into 3/4-in pieces. Place on the other foil-lined pan; toss with remaining oil. Roast tomatoes and spaghetti squash on top rack 40 minutes until you can easily pierce squash shell. Roast zucchini on bottom rack 30 minutes, tossing once, until tender and slightly browned. Although spaghetti squash can be found at the grocery store practically year round, it is my understanding that the fall is when that veggie is "in season". Regardless, the recipe looks delectable and I will try it.